NOS factory originals! Cabinet or "shop-out" decal set for use on any Alvin G. & Co. game. 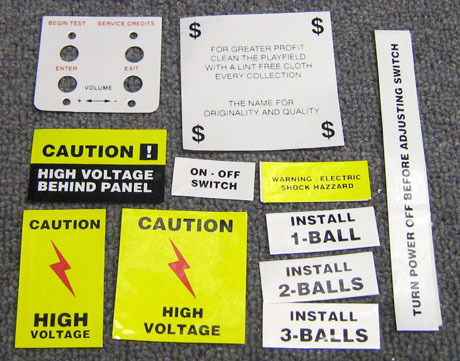 Includes 11 pieces, as shown in image, and featuring many hard-to-find decals such as test/service button panel decal, high voltage decals, # of balls decals, and more. Replace your worn, damaged, or missing decals with these mint condition factory originals for great looks or as a finishing touch to any shop-out or restoration.